Our travels Friday and Saturday took us from Cleveland, Mississippi, across Arkansas and to Andrews, Texas. Andrews is named for Stephen Andrews, the first Texan soldier to die in the Texas Revolution. Our giant book of RV parks listed a park in Andrews and one nine miles north of town. We opted for the closer one, listed as a motel/RV park, for our overnight stay instead of burning almost two gallons of gas for an overnight parking space. The little motel/rv park formerly had rental RV spaces behind the motel. Apparently someone made a good deal (if there is such a thing) on a dozen former FEMA trailers and set them up. Now the motel’s roadside sign states, “One bdrm trailers for rent”. The formaldehyde might keep these trailers rodent free, too! 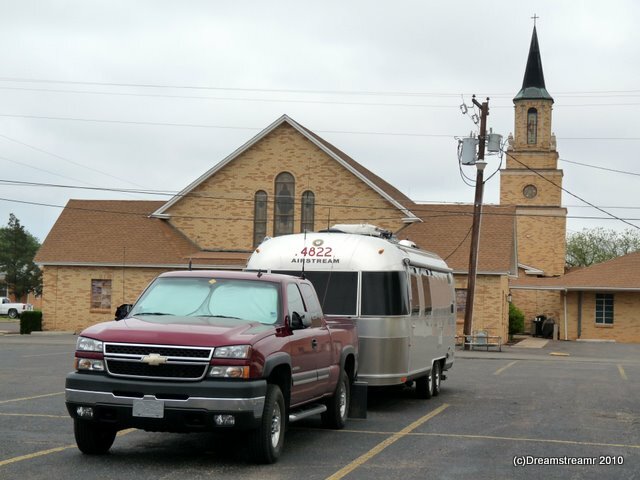 Not having found a place in the motel’s “rv park” to park our rig, we opted to park temporarily in the adjacent lot of the Means Memorial Methodist Church. Having determined we would not be renting a space at the motel/RV park, we decided to ask the church if we could use a little of their large, level parking lot. Rock music was echoing from the sanctuary as we approached via an unlocked exterior side door. The music stopped and we poked our heads in and asked if our overnight parking was okay. We readily received a welcome and permission to park, since we weren’t going to use any utility connections. We made a cup of tea, showered, and were relaxing when someone knocked on our Airstream’s door. Happens all the time, you know, people just want to know if they can see inside one of these trailers. But no, this was Reverend Rick Doyle, the pastor of Means Memorial Methodist Church. Rick visited with us almost an hour, talking with us about what makes Andrews, TX, such a good place for his church and his family. We enjoyed listening to him and sharing with Rick our experiences with various Methodist churches across the U.S., and what seems to make some of them stand out for us. Rick warmly welcomed us to stay the night in the church’s parking lot but also told us of free camping with full hook-ups. The Chamber of Commerce, apparently, offers a half-dozen full hook-up sites for overnight visitors to Andrews, TX. We suppose it’s unsurprising the commercial campground directories wouldn’t list free parking, but how would we find this otherwise? Umm, ask at the churches? 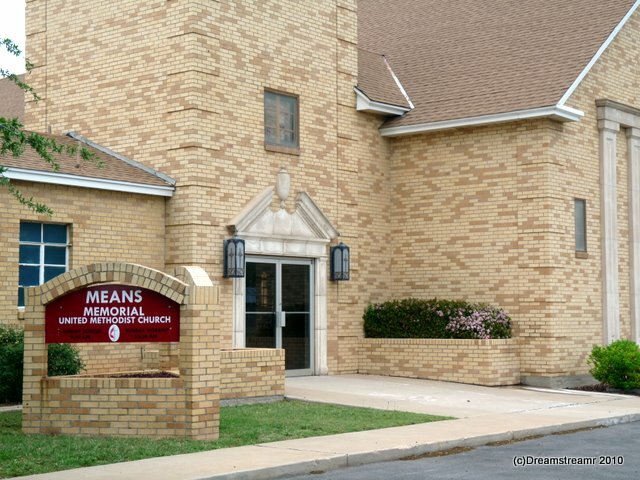 Sunday we left our friendly overnight space at Means Memorial Methodist Church in Andrews, TX, and made a leisurely drive to Carlsbad Caverns National Park. 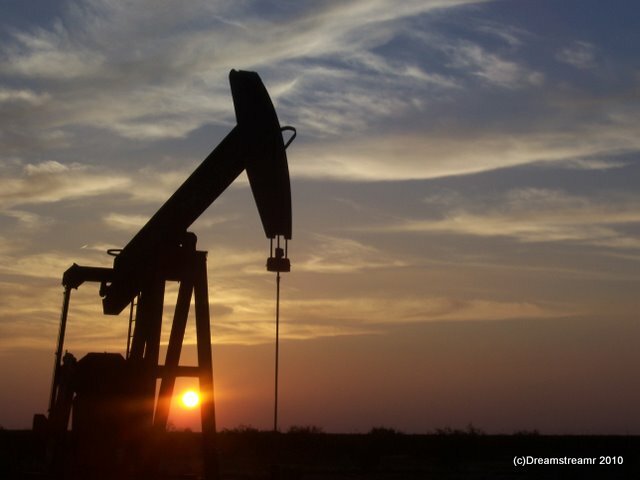 The drive was interesting for us — never had we seen such a large number or variety of pump jacks, or horse head, or nodding donkey, or thirsty bird oil pumps. And we didn’t see ANYTHING else, save a couple of deer bounding across the highway ahead of us. 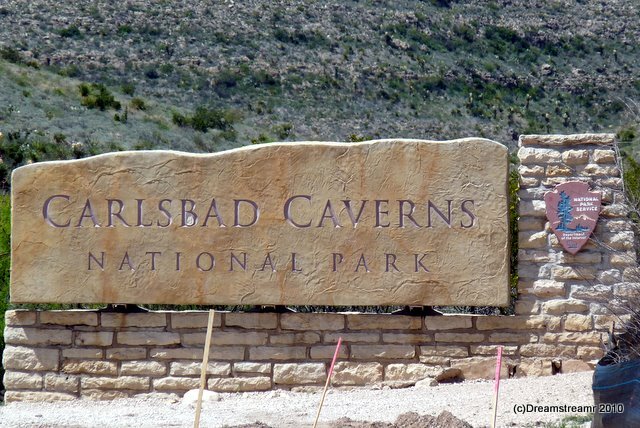 We enjoyed our visit to Carlsbad Caverns National Park. We drove directly to the Park with our trailer, counting on RV parking, so we could wait until late afternoon to find a campground for two nights. Parking was easy because we are early in the season and the Park Service has several large parking areas. We opted to walk into the Cavern rather than use the elevator (lowerator?) to drop 750 feet from the visitor center to “The Big Room”, an area as large as 14 football fields. Our walk lasted almost three hours and covered just over two miles. The walking wasn’t strenuous or overly long, but the low light taxed our eyes and brains mightily. 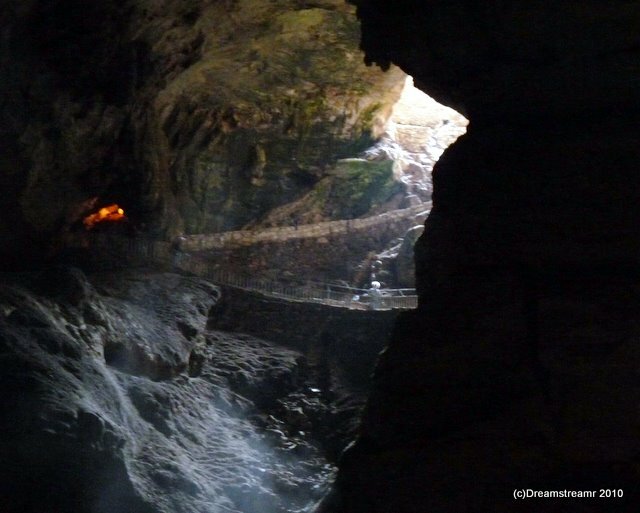 We had just enough artificial lighting to see the features and, with 1/8 to 1/10 second hand-held camera exposures, to take these pictures. Only upon arriving back at our RV did we realize how tired our eyes were from straining in the cavern. 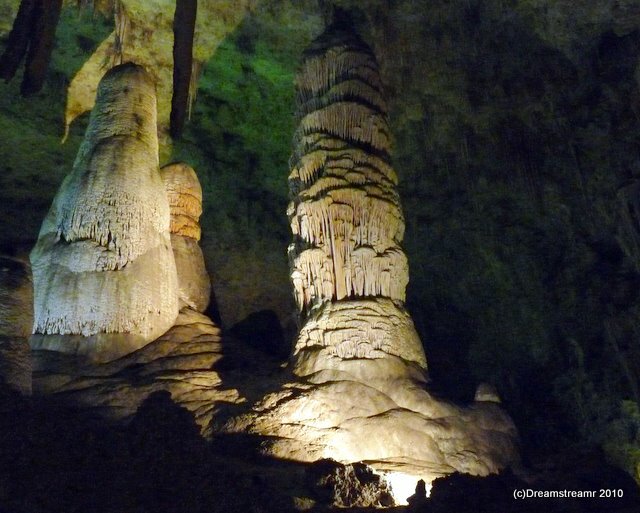 Carlsbad Caverns holds the most amazing array of naturally formed figures. 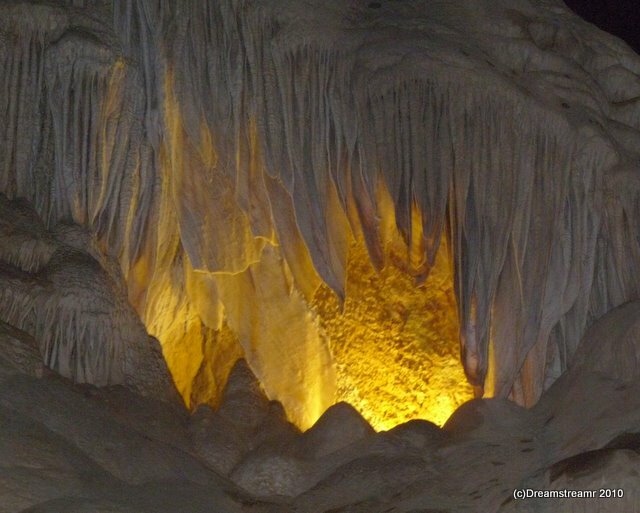 Most amazing to us is the time required to build these speleothems — approximately 500,000 years of single drops of water, each loaded with calcite. Our lifetimes are a mere speck of time compared with the build time of a stalagmite. We weren’t thinking about our eyes when we were staring at many forms of cave decorations, the stalactites, stalagmites, domes, columns, and draperies. We also weren’t thinking about the thousands of bats who make their home in the Caverns. A ranger advised us, on our way down the entrance trail, the bats have not returned from their Central America snowbird location. This year’s unusually cold and wet winter apparently dampened (or cooled) the bat’s interest in returning until later. Just as well for us — in our old house we had as much bat fun as we could stand, before we finally enlisted professional help to relocate the bats to our neighbors’ trees and houses (at least, that’s where we think the bats might have gone). This week starts our Southwest Adventures caravan with over two dozen other Airstream trailers and motorhomes. We’ve been looking forward to this for over a year, and are excited about starting. We’ll try to share the highlights with you as we go along. Until then, we’re on the road again.